The CEH v10: Certified Ethical Hacker Version 10 Study Guide is your ideal companion for CEH v10 exam preparation. This comprehensive, in-depth review of CEH certification requirements is designed to help you internalize critical information using concise, to-the-point explanations and an easy-to-follow approach to the material. Covering all sections of the exam, the discussion highlights essential topics like intrusion detection, DDoS attacks, buffer overflows, and malware creation in detail, and puts the concepts into the context of real-world scenarios. Each chapter is mapped to the corresponding exam objective for easy reference, and the Exam Essentials feature helps you identify areas in need of further study. You also get access to online study tools including chapter review questions, full-length practice exams, hundreds of electronic flashcards, and a glossary of key terms to help you ensure full mastery of the exam material. The CEH certification puts you in professional demand, and satisfies the Department of Defense's 8570 Directive for all Information Assurance government positions. Not only is it a highly-regarded credential, but it's also an expensive exam—making the stakes even higher on exam day. 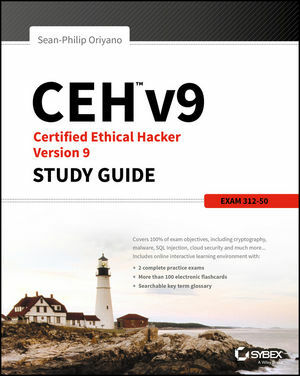 The CEH v10: Certified Ethical Hacker Version 10 Study Guide gives you the intense preparation you need to pass with flying colors. Sean-Philip Oriyano, CEH, CISSP, is an IT veteran with experience in the aerospace, defense, and cybersecurity industries. He has consulted and instructed on topics across the IT and cybersecurity fields for both small clients and large enterprises, and has taught at such locations as the U.S. Air Force Academy and the U.S. Naval War College. Sean is a member of the California State Military Reserve, where he serves as a warrant officer specializing in networking and security.